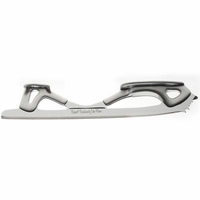 Every John Wilson blade is produced using laser technology for unmatched precision on the ice. The process commences with laser cutting to guarantee blade geometry accuracy to 0.004 inches (the thickness of a human hair). State of the art surface treatments and coatings ensure a premium quality blade.